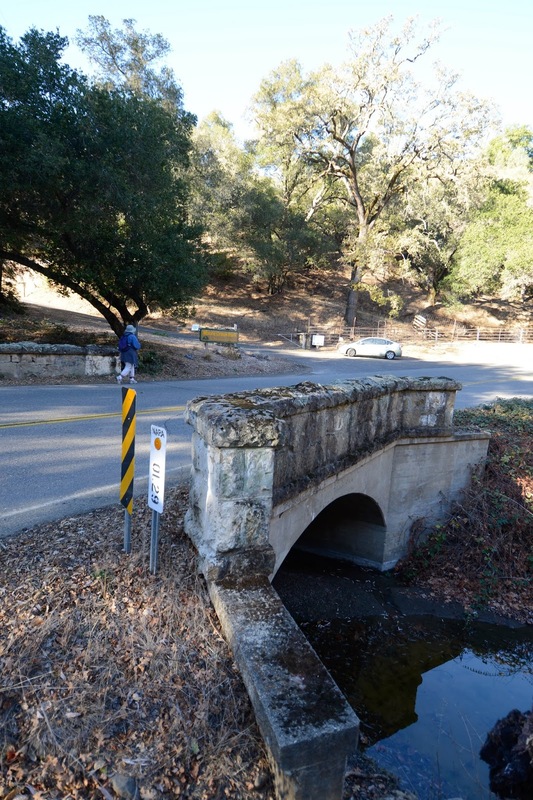 This Chiles Pope Valley Road Bridge (21C0076) was built in 1910. It's 25 ft long and was widened on the east side (like the previously studied bridge) with concrete. It appears they took the existing stone barrier and moved it onto the wingwalls and closed spandrel wall of the widening. We can see the same names as on many of the other historic Napa County bridges. Napa County Surveyor, O.H. Buckman also designed the Swartz Creek Bridge in 1912. Buckman served as a Napa County Surveyor from 1895 until about the time of World War I. The abundance of masonry arch bridges in Napa County is primarily due to his design efforts. This bridge was built by contractor A.C. Martini as were many other bridges in Napa County. The reason this bridge wasn't selected as a historic place was probably because it was widened. The National Registry of Historic Places wants their bridges unaltered. Napa County, California Bridges: Chiles Pope Valley Road Bridge across Chiles Creek by Mark Yashinsky is licensed under a Creative Commons Attribution-NonCommercial-NoDerivatives 4.0 International License.